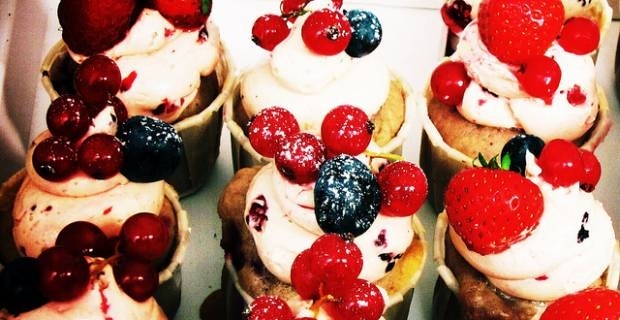 Coming out of a long, dark and cold winter, berries and summer fruits can really spark up a celebrating mood, so pamper yourself with this special treat: blueberry and raspberry cup cakes! Here is a lovely recipe for cup cakes to enjoy on a special occasion and, why not, to celebrate the arrival of the good season! Preheat the oven at 180 C/ Gas mark 4. Prepare the 12 silicon cup cakes moulds, or alternatively line 12 muffin tin cups with paper liners. In a small bowl, stir in 1 tbsp of flour with the blueberries. In a medium bowl, sift the remaining flour, the salt and the baking powder. Set aside. Beat the butter and sugar in a large bowl, either by hand or using anelectric mixer for a couple of minutes, until smooth and light incolour. Keeping mixing, blend in the egg whites until smooth again.Then add the vanilla and almond extracts and beat in until smooth but foamy. It is time now to add the flour mixture, but do it in two steps: first add only half of the mixture, blending it in on lower speed, just enough to mix it in with all the other ingredients.Then add all the milk and mix that in as well. Finally, mix in the remaining flour mixture. Mix it in well and keep beating until smooth. Fold the blueberries and rasperries into the batter using a spatula. Fill up each liner with batter, but only up to ½ inch below the top. Place on a rack in the middle of the oven and bake for 25 minutes, or unti la toothpick inserted in the centre of of the cup cake comes out clean. In a large bowl, place the cream, icing sugar and vanilla and whipp together. It will be ready when firm peaks form. Remove the cupcakes and place onto a wire rack to cool. Using a small spatula, spread approximatively 3 large spoons of icing one ach cup cake. Decorate with the berries. Cover and refrigerate for up to 5 hours. These are happy, summery treats to serve and appreciate cold. 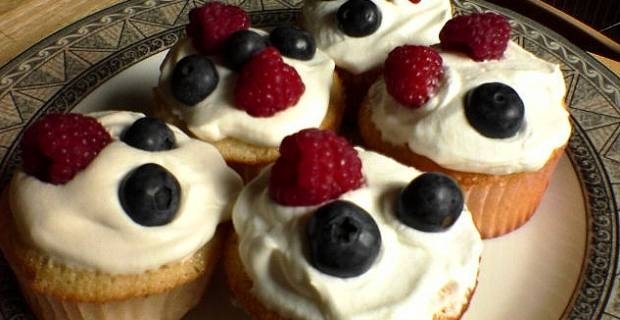 Use only fresh ingredients and make the best out of them: with fresh, vitamin and antioxidant packed berries, these cup cakes are delicious and good to you at the same time. A recipe for cup cakes that are a real treat to share and enjoy.